The National Championship team: Dustin Argo (Summit), Will Beatrez (St. Edward), Alex Lathem (Westlake), Maxwell Mehlman (St. Edward), and captain Adam Sichel (Indian Hill). Coaches: Larry Dean (Summit) and Chris Lapp (Summit alumnus, Notre Dame Law School). This is the 1st National Championship for Ohio since the Upper Level team in 2005. 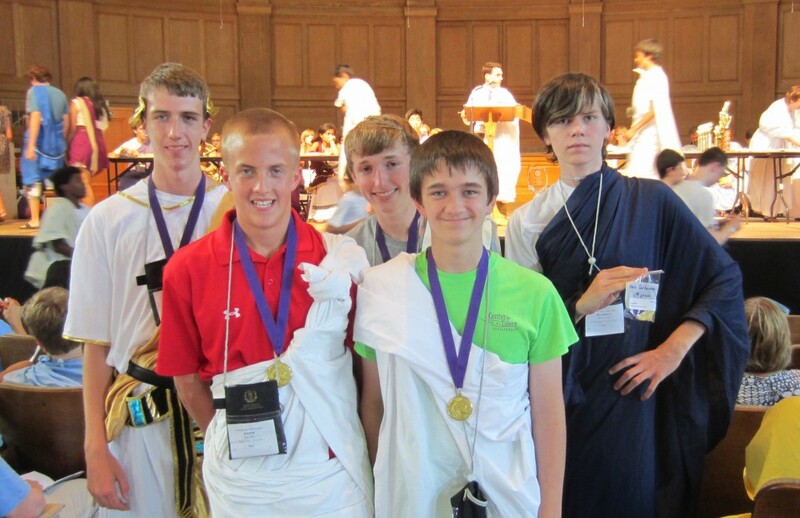 Cut & paste this link into your browser for a video of the entire Novice Certamen finals [I couldn’t get the link to work]: http://www.youtube.com/watch?v=ECrO1-XcggA. It was truly a team effort. All 4 players contributed to the victory by winning toss-ups. Adam, fulfilling his role as captain, led the way with 4; Will really shined on the Big Stage with 2; and Dustin & Alex each took 1. The tide seemed to turn in OH’s favor after a review of a missed question. They had initially rejected parco as an antonym of neglego (agst OH), but this ruling was later overturned (for OH). That took pts away from MA and added pts to OH. OH then will on a roll and had an insurmountable 25 pt lead going into the final question (which OH also got). The OH fans mobbed the stage at the conclusion of the match. 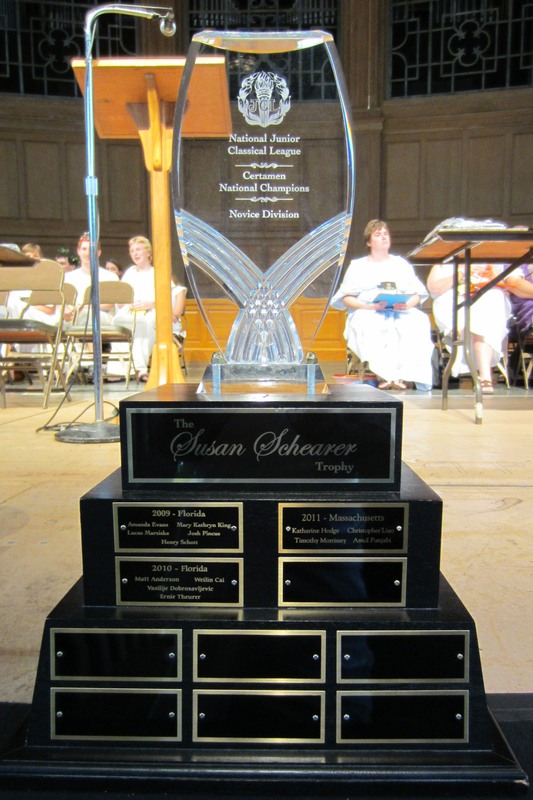 The 5 OH National Champions will have their names engraved on the trophy for posterity. Melissa Burgess of Indian Hill – not as powerful as Amy Elifrits but probably as powerful as the SCL – was kind enough to get it home from Wake Forest. 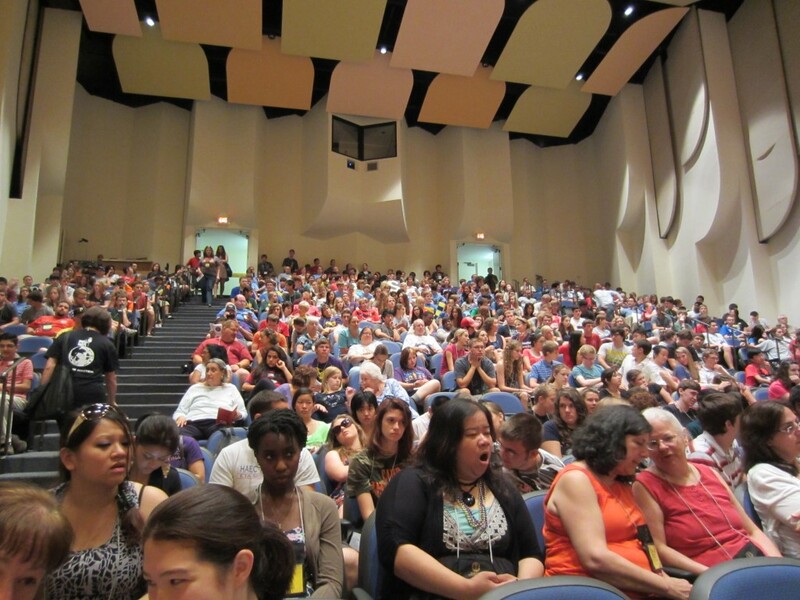 It will start at Indian Hill, the school of captain Adam Sichel. As the year progresses, the trophy will visit Summit (Dustin Argo), Westlake (Alex Lathem), and St. Edward (Will Beatrez and Maxwell Mehlman). The Novice Finals, with Certamen Chair Tom Reed at the microphone. 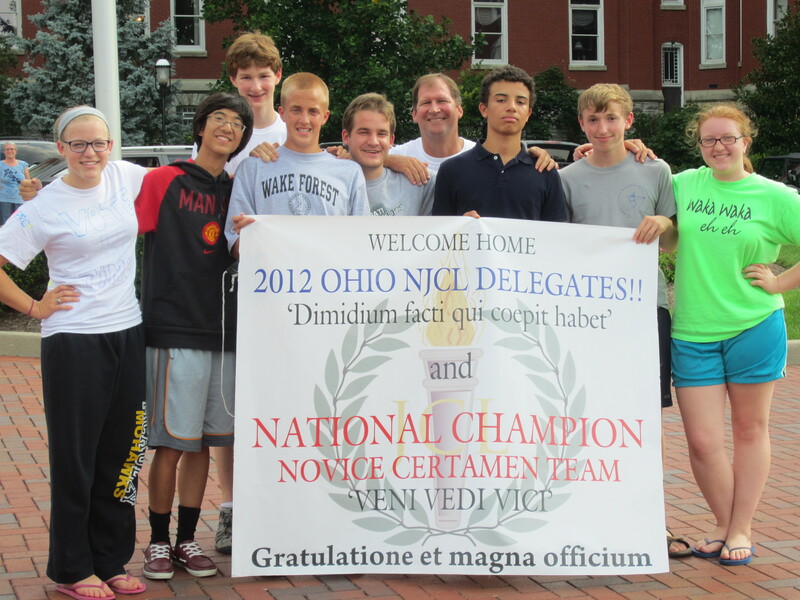 The Cincinnati half of the Certamen Group, with the banner.